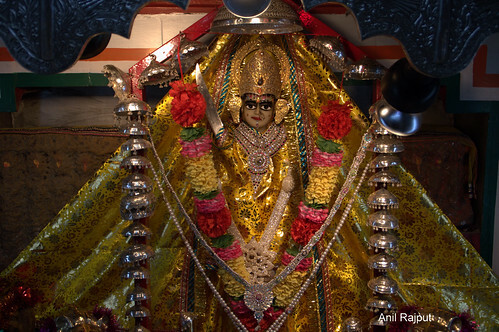 Tanot Rai Mata Temple is situated very close to the India Pakistan border about 120 km from Jaisalmer . In Vikram Samvat 847 (792 AD) the City and Fort of Tanot was made capital by the Bhati King Tanu Rao and the Goddess Mata Tanot Rai , the incarnation of The Mata Hinglaj whose main temple is in Baluchistan now in Pakistan, was established as a Siddha Peetha in Vikram Samvat 888 ( 832AD) , since then the generations of Bhati Rajputs , people of Jaisalmer and surrounding areas pay respect to Mata Tanot Rai as their Kul – Devi . In 12th Centenary the Bhati King Maha Rawal Jaisal, shifted their capital to Loduvra, Jaisalmer for strategic reasons but the temple of Mata Tanot Rai remained here . The legend is that the Hinglaj Mata is a Shakti Peetha of Ma Sati worshiped in the form of Ma Durga or Devi , the main temple is in Baluchistan now in Pakistan , pleased with the worship of a person name Mamadia from village Chelak in Jaisalmer , gave him a Boon that she will take birth as his daughter, in the year Vikram Samvat 808 Chaitra Sudi 9th day on a Tuesday ( 752 AD) took birth , daughter was named as Avad Devi and then the other six sisters named Ashi , Seti , Gehli , Hol , Roop and Lang were born , Mata Avad Devi showed her miracles in due course of time and also came to be known as Nagrenchi , Kale Dungar Rai , Bhojaseri , Deg Rai , Tebher Rai and then the Tanot Rai . The miracles shown during the war with Pakistan , in October 1965 the Pakistani Army entered into Indian territory from two places Kishen Garh and Sadewala but could not reach this place in spite of heavy Artillery Shelling and fierce gun battle . Locals claimed that Ma Tanot Rai appeared in the dreams of few Indian Soldiers and said she will protect them until they remain in the temple area. It is said that out of more than Three Thousand bombs fired , Four hundred and Fifty bombs fell within the temple complex but either went blind or could not explode, encouraged by this miracle , Indian soldiers retaliated with Two Companies of BSF and One Battalion of Grenadiers with the blessings of Ma Tanot Rai repulsed and broke the backbone of One Brigade of Pakistani Army who retreated back leaving behind hundreds of their dead soldiers , Tanks and trucks . After the 1965 War the Border Security Force established a regular post and took over the management and perform the daily two time Aarti at Mata Tanot Rai Temple . Mata Tanot Rai is considered to be the guardian of all the sons of the motherland who are posted in this sector. Any armed Forces personal, who joins for duty in this sector, irrespective of his religion he belongs to, first pays respects at this holy shrine. Again on the night of 4th December 1971 Pakistan army attacked from Longewala side with One Infantry Brigade and one Armour Regiment , the Indian army of One Company strength of Punjab Regiment and One Company of BSF with small weapons repulsed the attack with the blessings of Ma Tanot Rai , Pakistani army retreated , leaving behind the 34 destroyed tanks and over 100 other vehicles many killed soldiers , only two of the Indian soldiers got martyrdom in this battle. Every year on 16 December Vijay Divas is celebrated at the Memorial Pillar at entrance of Ma Tanot Temple to remember the heroic deeds of our soldiers . Twice a year during the Navratras ( April and September ) nine days Langar (community free kitchen ) and celebrations are organised by the Border Security Force .